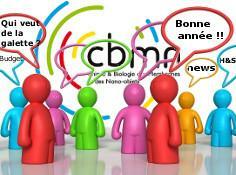 The next general assembly of CBMN will take place on Tuesday 8th January at 3.30 pm in ENSCBP lecture hall B. This presentation will be in French but the slides will be in English. If there are questions they can be asked in French or English. After this moment of information and exchange, we will meet for a moment of conviviality around our traditional Twelfth Night cake.